A new London skyscraper that reflects sunlight at an intensity capable of melting parts of a car became the latest attraction in the city’s financial district on Tuesday as the developers acted to find a quick fix. 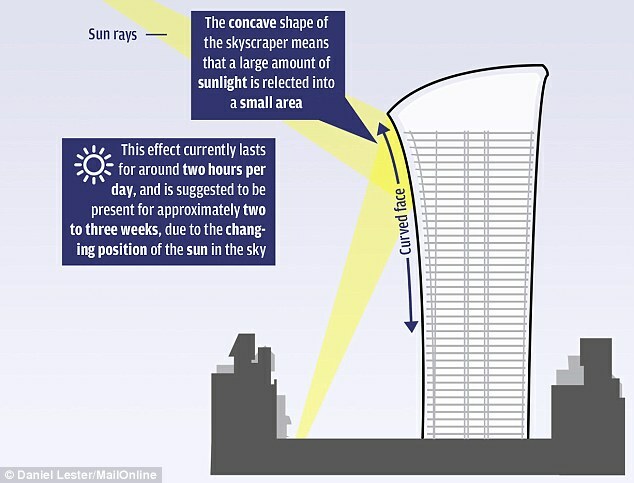 A London skyscraper has a bizarre design flaw: The building is reflecting the sun’s rays at such high temperatures that the glare is melting cars and raising temperatures in a particular spot up to 150 degrees. 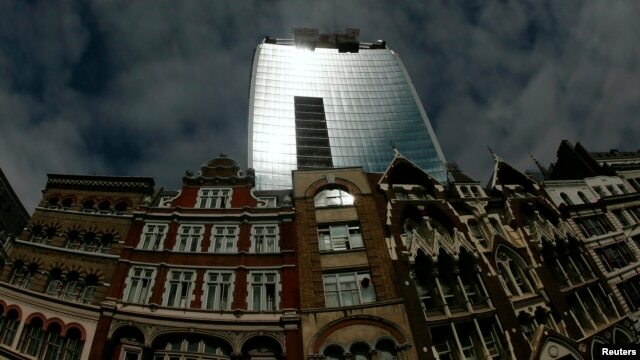 The glass-clad tower, dubbed the Walkie Talkie for its distinctive flared shape, was blamed this week for warping the wing mirror, panels and badge on a Jaguar car parked on the street below the 37-story building that is under construction. Business owners opposite 20 Fenchurch Street pointed to sun damage on paintwork on the front of their premises and carpet burns. TV crews fried an egg in the sun beam reflected from a concave wall of the tower watched by bemused spectators. Motorist Martin Lindsay said he left his car for an hour opposite the building and returned to find the wing mirror, panels and Jaguar badge had “melted”. Business owners and motorists today hit out at developers of a new skyscraper which they blame for starting fires and causing damage by reflecting the sun’s rays. The half-finished 37-storey tower in central London has been dubbed the ‘Walkie Scorchie’ due to its distinctive shape and apparent ability to bounce heat from the sun onto buildings in the next street. Angry business owners in Eastcheap say the £200 million project has blistered paintwork, caused tiles to smash and singe fabric. A motorist has also said the intense heat melted part of his Jaguar. One shopkeeper said the glare caused his doormat to start smoking and damaged a lemon, another said it blistered paint – and one journalist even managed to fry an egg with the startlingly bright rays. Developers called the problem with the building at 20 Fenchurch Street ‘a phenomenon’ and said they are ‘looking into the matter as a priority’. Cyclists have also reported scorched bicycle seats. Ali Akay, of Re Style barber’s, said the position of the sun at a certain time of the day caused a searing bolt of sunlight to start a small fire and burn a hole in his company doormat. He said: ‘We were working and just saw the smoke coming out of the carpet. We tried to cut the fire down, there were customers in at the time and they were obviously not happy. Mr Akay, 22, said they had spoken to the managers of 20 Fenchurch Street to find a solution. Next door at the Viet Cafe, Diana Pham, 25, said they had suffered similar problems. ‘Yesterday it was very hot so there was a concentration of light here,’ she said. ‘We thought something was burning in the restaurant but it wasn’t, we searched everywhere. Motorists have reported problems, too. Local businessman Martin Lindsay told City A.M. his high-spec Jaguar XJ, parked on Eastcheap on Thursday afternoon, had warped panels along one side. The wing mirror and badge had also melted from the heat of the reflection, he claimed. Van driver Eddie Cannon, a heating and air conditioning engineer, told the newspaper: ‘The van looks a total mess. A joint statement from developers Land Securities and Canary Wharf said: ‘The phenomenon is caused by the current elevation of the sun in the sky. ‘It currently lasts for approximately two hours per day, with initial modelling suggesting that it will be present for approximately two-to-three weeks. ‘As responsible developers we are making every effort to keep local businesses informed and we have communicated with them regularly since the issue first appeared. ‘While we investigate the situation further we have liaised with the City of London to suspend three parking bays in the area which may be affected. Three parking bays were closed off opposite the 239-million-pound ($371 million) tower to avoid more damage, as a steady stream of spectators observed and photographed the building. “This solution should minimize the impact on the local area over the next 2-3 weeks, after which time the phenomenon is expected to have disappeared,” they said in a statement. The Walkie Talkie, due to open in spring 2014, is one of a series of striking, modern buildings to go up in the area of London known as the “Square Mile”, where 300,000 people work in financial and professional services, with other notable towers dubbed the “Gherkin” and the “Cheese Grater”. A spokesman from the City of London Corporation, which is in charge of planning and building control in the area, said City officials were working with developers to resolve the issue. The architect is Uruguayan-born Rafael Vinoly and the building’s concave design means developers can squeeze more money from its larger upper floors, where the views over London promise to be magnificent and rents are higher. It is not the first time a Vinoly building has been linked to intense rays of sunlight. The Vdara Hotel in Las Vegas allegedly produced intense areas of heat, according to reports in U.S. media three years ago. Vinoly was not immediately available for comment on Tuesday. Building contractors suggested the developer may have to install anti-glare film on the windows, replace whole glazing panels in the problem area, or adjust the angle of the panes. He said blame may be leveled at the architect or engineering companies for not spotting the problem during the design stage but, with Canary Wharf Group as the developer and main contractor, it was likely to be resolved internally soon.